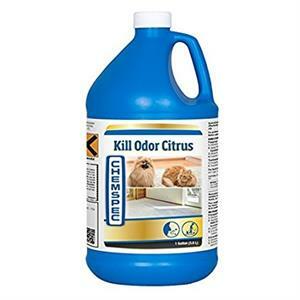 Kill Odor Citrus is extremely effective on bacterial and fungal odors as well as general odors. Kill Odor neutralizes odors caused by urine, vomit, smoke, perspiration, medicinal, rancid foods, etc. Kill odor contains Intersept, an EPA Registered antimicrobial shown to be effective against a wide range of odor-causing microorganisms. Especially formulated for the professional cleaner; can be used in rug cleaning plants with dry rooms to eliminate the odor sources which can result from high humidity or can be applied on location as a pre-spray to treat the carpet; can also be used to treat odors in the carpet backing or pad. Kill Odor is effective in the removal of odors from ceramic tile, concrete, wood, vinyl, plastic, marble and other hard surfaces; may be wiped on, sponged or mopped with excellent results expected on hard surfaces. A valuable part of a complete odor removal programs; the ability of Kill Odor to accomplish odor elimination makes it ideal as an intricate part of any complete odor removal program. Economical Concentrated for use up to 64:1 on hard surfaces. Concentrated Kill Odor allows you to meet the odor demand the first time. Easy to use Simply spray properly diluted Kill Odor on affected area using a portable hand pump or electric sprayer.